Accessing the Online Fitness Community. – The Small Things. 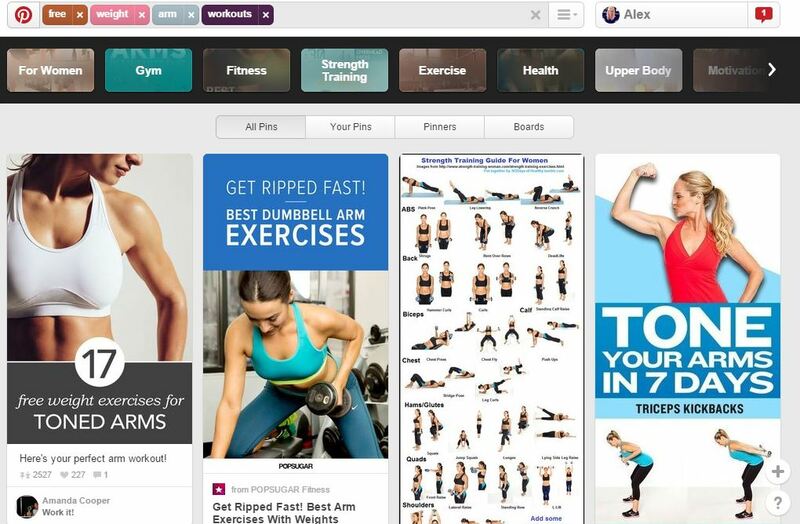 Accessing the Online Fitness Community. With the arrival of warm weather (finally) I’ve been spending a lot more time in my back yard than at the gym. Don’t get be wrong, there is no better thing than a little fresh air but skipping gym days makes it difficult to get into ideal summer body shape. I’m still running on the regular in prep for my upcoming 5km race but there is so much more to fitness than cardio. So I turned to the great and ever expansive world wide web. I think that the fitness corner of the internet can be described in two words: contradictory and overwhelming. There is so much information out there (and here I am adding to it) and it is all over the place. Everyone has an opinion. Some people insist that cardio is the be all and end all of exercise. Other people swear by weight training. Some people only use their own body weight, others only use a bar bell. The list goes on… and on and on and on. It is very easy to get lost and discouraged when searching the internet for fitness advice.It is also easy to fall into traps and scams. I have found that these traps look something like this. Sounds pretty great, huh? Seriously! Except it gets not so great really fast when you start to read the fine print. Lets break this down, shall we. Sign up for free: This is code for get a user name and profile for free. But access to the online content such as workout videos, meal plans, ect. only comes with the premium package. 30 Day trial: How is it unlimited if it is limited to 30 days?… Because they take your credit card info first! Your 30 day trial begins as soon as you press the enter button and once those 30 days are up you are charged automatically charged a hefty fee. No reminder emails, no warnings and no returns. Nothing but a very large expense. After that you’ll be charged a weekly or bi-weekly fee for your membership. Unlimited access: But only if you have wifi. There are no downloads here. This content is for streaming only. In addition you don’t have the ability to actually converse with these personal trainers, they just record the videos and sell them to the website to stream. Sorry. We deliver results*: See the asterisk there, that means there more here than meets the eye. Waaaaaaaay down at the bottom of the webpage in size 2 font you will find this disclaimer. “*Results vary depending on starting point, goals and personal effort”. There it is, the harsh reality that the only thing that can make you fit is your own personal effort. It doesn’t matter how much money you spend or how many videos you have access to, all that matters is how much effort you put into it. My point here is that paying for fitness advice online is a waste of money. Paying for a real life trainer can be a great investment, but when the content is online only, it’s just not worth it. Especially when there is so much great free content available online. But as I mentioned earlier, there is a lot of material to sift through. Sometimes it just takes a little trial and error to find what works best for you. Some focused searching helps as well. Below is a list of where I look online to find quality fitness content. Cardio: Apps! Apps, Apps, Apps. Whether you are running, biking, swimming or walking. There’s an app for that! Earlier this year, when I was getting into running I needed as much guidance as I could get. So I used the Couch-to-5K app. It is a 10 week interval training program that told me exactly when to jog and when to walk. Now that I am comfortable running without assistance I use the Map My Fitness app. This monitors my speed and distance using the gps tracker in my phone, so that I can keep track of my progress. Both of these apps can be used outdoors or on the treadmill. Health Food: Blogs! Fit foodies love to share! Sometimes food blogs can be intimidating because the pictures are so beautiful or they use fancy ingredients. But there are also many, MANY food blogs out there that keep things simple and easy. Those are the blogs you want to follow. If/when there is an ingredient or a method that you are confused about send them an email or leave a comment. Most bloggers will respond to you directly or write a post based on the questions they have received. Weight Lifting (at home): Pinterest! I have found that using free weights at home can get pretty stagnant pretty fast. Probably because the only free weight moves I can ever think of are bicep curls and squats. Both great moves, but alone they make for a pretty boring work out. I have found that pinterest info-graphics are a great place for free weight workout inspiration. There is an endless supply of new and different combinations of moves, just make sure your search terms are clear and focused. Yoga & Pilates: YouTube! Being that I am pretty new to yoga I feel like I need instruction. Sometimes I will splurge and go to a class but that can get pricey real fast. So I have found that youtube videos are a wonderful tool. It is yoga instruction from the privacy of your own home. Finding a video teacher who you like is one of those trial and error situations. But reading user reviews and number of views is a easy way to figure out what is good and what is not so good. Recently I happened upon a YouTube channel called Yoga with Adriene. She has a series of yoga instruction videos, some are designed for beginners, some for weight loss. I am attempting her 30 days of yoga with Adriene challenge (more on that in another post). Community: Facebook! These days, most organizations, groups and personalities have facebook pages. All you have to do is press the follow button and you are part of the social community. For example: One of my favourite fitness bloggers, The Fitnessista, has a FB page. On it I am able to interact with other readers and have conversations about the content of the blog. We can share stories, be supportive, provide motivation, ask questions. However, it is important to keep in mind that FB is a public forum and people can say anything from behind the safety of a key board. Haters gonna Hate. Just use the search bar to find the community you are looking for. There is a public group called Exercise Motivation and it just shares and spreads motivational wisdom! How great is that?! The hardest part about online fitness is that you consciously have to make the effort to workout. Sometimes it’s easier to skip a workout because you are at home alone instead of at the gym surrounded by other people. Just remember, as with all forms of fitness you will only get out what you put in! Where do you go to find fitness online? ← What I Ate Saturday: Descriptions of all the delicious food I ate this weekend. Oh it’s good to see you like MapMyFitness! 🙂 And I couldn’t agree more about Pinterest, I am totally addicted to it, haha!